With more Thai restaurants opening and ingredients becoming more easily available, many of us will have had and enjoyed our first taste of Thai food. Some of us will be devotees! But, while we're familiar with Pad Thai or Thai Green curry, if we were offered Thong-Ek for pudding, we might be a bit uncertain! Thai desserts are renowned for their intricacy and the time and care involved in their creation. With many having their basis in just three ingredients - flour, sugar and coconut - almost one thousand different sorts of dessert have been created by Thai chefs in the past. These days fewer are on offer, or even to be found. Buddhist ceremonies led to the creation of many desserts with ingredients chosen because of their properties in order to bring good luck or success to the family. The Thong family of desserts are all meant to bring prosperity, 'thong' meaning gold. You'll be pleased to know that the recipes we've chosen aren't complicated or time-consuming! But they will give you an authentic end to a Thai meal, or make a change from apple crumble! But we didn't say they'd be slimming! Place the first eight ingredients in a bowl and mix well to make a smooth batter. Heat the oil in a wok or deep fryer. Peel the bananas and cut into quarters. Dip them in the batter and turn to ensure they are completely coated. Deep-fry for about 5 minutes, turning once, golden-brown. Take out and drain on paper towel. Serve warm with ice-cream. Lightly fry the coconut in butter until golden. Don't let it burn! Separate the eggs, and put the two whole eggs plus 2 yolks in a bowl with the vanilla essence, coconut and pinch of salt. Whisk gently. Put the coconut milk and water in a saucepan and heat, stirring continuously for 2 minutes. Don't let it boil! Put the bowl with the egg and coconut mixture over a saucepan of simmering water, making sure the bottom of the bowl doesn't touch the water. Gradually blend in the warm coconut milk, stirring, until the mixture thickens slightly. You should be able to coat the back of a spoon with it. Now the ice-cream is ready for freezing. If you have an ice-cream maker, follow its instructions. Otherwise put the mixture in a suitable container and place it in the coldest part of the freezer. Leave for 1 hour then remove and beat it well. Return to the freezer until completely frozen. 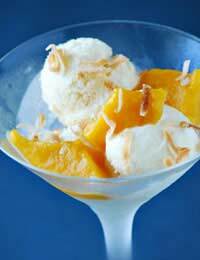 Serve with fresh fruit or deep fried bananas. Place the sugar and coconut milk in a saucepan and simmer gently until it starts to thicken. Remove from the heat. Continue stirring as it cools. Beat the egg yolks together and gradually add to the cooled milk mixture. Return to the heat and bring to the boil. Keeping the pan over a very low heat, gradually add the sieved flour until it is all mixed in. Remove from the heat and set aside. When the dough is cool enough to handle, roll into walnut-sized balls or shape as you wish. If you have a sweet or chocolate mould, you can press the dough into that. Decorate with a little gold leaf.